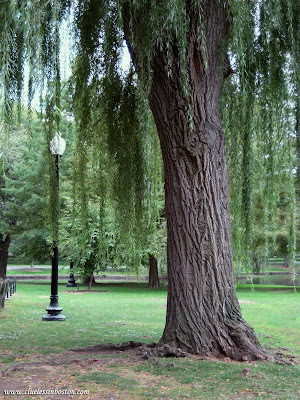 One of Public Garden's weeping willows, yes? Aren't they gorgeous? Thanks for this. I spent many an afternoon in my youth in Boston sitting under those trees, reading and dreaming. I may even have spent time under that very tree. I was appalled this summer when I saw people with coolers actually having a picnic in the Public Gardens. When I was growing up in Boston that wasn't allowed. A friend explained to me that they were allowing it because the Common was closed for renovation. Lovely photo! !